It’s been a long time since Scott Byrd stepped out onto the baseball field at Jefferson County High School as a player. Yet, he still steps on high school athletic fields every day in Sevier County. 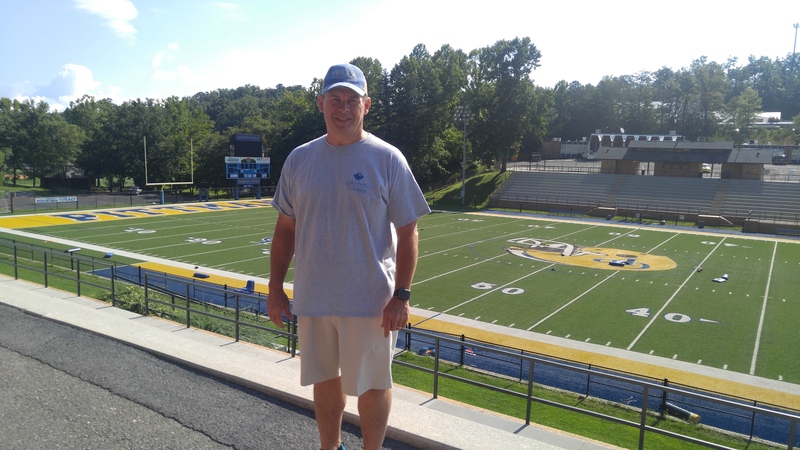 As the coordinator of LeConte Sports Medicine, Byrd oversees certified athletic trainers at every Sevier and Cocke County high schools, giving our players and coaches an invaluable resource and a leg up in a competitive sport. But he doesn’t do it for the wins, even though he admits all teams want to win. Byrd does it because he knows sports are about being part of something bigger than yourself, being part of a team. And that team works best when players are healthy. LeConte’s team of athletic trainers do tape ankles and provide advice on hydration, but there is so much more to the job. Most of it is about injury prevention. Once practice starts, trainers are responsible for checking the heat index, and stopping or modifying practice if it gets too hot. Being fluent in the Tennessee Secondary Schools Athletic Association’s (TSSAA’s) safety guidelines is a key responsibility, and it’s a huge one. The guidelines let you know how long you can practice, what equipment you need to wear at what temperatures, and more. If you break those rules, you could get your entire school into trouble, but more importantly, you put students at risk of injury. A quality relationship between the trainer and the coach is key. A coach really needs to know he or she can trust the trainer, and in return, the trainer helps the coach focus on practice and the game. Any school that has an athletic trainer has an advantage. Sometimes a trainer offers guidance on proper technique and adjusting a position in a drill. Good form is key, and coaches and trainers must work together to ensure that occurs. “Five minutes. That’s the amount of time we have to get an injured athlete evaluated and treatment started,” says Byrd. In fact, research shows that if you can reach them that quickly, athletes have a much better chance at healing properly, and returning to play faster. Most of us have probably been at a football game when a player went down. The stadium holds their breath, and a game that was full of cheering moments before suddenly becomes eerily silent. This is when Scott and his team go to work. LeConte’s athletic trainers are highly skilled at what they do. Each one has to have a four-year degree from an accredited school, then they must pass a national board certification exam and hold a Tennessee state medical license. The knowledge is paying off. In 1999, before Sevier County and LeConte began the athletic trainer program, the re-injury rate of students in the county was just over 25%. That means, if a student was injured, there was a one in four chance that the same student would suffer an injury again. Since starting the athletic trainer program, Sevier County’s re-injury rate has dropped to a record low of less than 1%. Any coach would be happy with those statistics. Trainers keep our kids playing instead of on the sidelines. He also gives great advice. Make sure your child’s coaches are knowledgeable and following TSSAA safety guidelines. You should be hearing them talk about proper techniques to avoid injuries, and they should be allowing water breaks. In the end, Byrd strongly feels that allowing kids to experience athletics is a good thing. He’s seen shy kids who would barely talk their freshman year connect with team-mates and become a chatter-box by their senior year. That happens even if they never score a touch-down. They are all part of that team, and they all contribute something. “In my early years at GPHS, I had a student who injured her knee playing softball,” says Byrd. That event brought back a flood of emotion. Byrd suffered a very similar injury when he was in high school, an injury that changed his entire life. As a baseball player at Jefferson County, he had high hopes of playing in college and beyond one day. His injury set him back, but not for long. They didn’t have athletic trainers at his school at that time, but working with doctors helped him get back on the field, and back in the game. He did play in college, and eventually decided he wanted to help others. So, when his softball player went down, Scott knew exactly what she was feeling. That player recovered, went to college, and now has returned to work under Scott as one of LeConte’s certified athletic trainers. The circle continues. Need to find a doctor for a physical before starting a youth sports program? You can find one by vising our physicians’ directory.